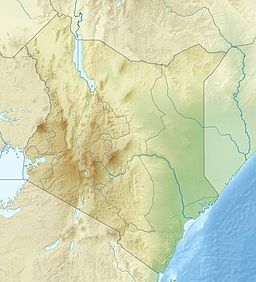 The Cherang'any Hills are a range of hills in the western highlands of Kenya. The hills are one of Kenya's five main forests and catchment areas. The highlands, the large central plateau, is divided by the Mau Escarpment which rises from the border with Tanzania up to the Cherang'any Hills. The escarpment bounds the plateau that rises to the slopes of Mount Elgon. The Cherangany Hills span three counties namely Trans Nzoia, Elgeyo Marakwet and West Pokot and reach elevations of 3500 m above sea level. Notable peaks include; Kameleogon (3581 m), Chebon (3375 m), Chepkotet (3370 m), Karelachgelat (3350 m) and Sodang (3211 m). They are home to a marginalized hunter-gatherer community called the Sengwer. The Cherang'any Hills are not of volcanic origin, they were formed as a result of erosion of the surrounding material leaving behind high residual mountain ridges. They are located on a forested escarpment with sheer cliff walls surrounding them on three sides. Visible are forested ridges and stark, rocky gorges. The hills form one of the two primary sources of Nzoia River, the other being Mount Elgon. The Cherang'any Hills are monitored by the United Nations Environmental Programme as one of the five most important water catchment areas in Kenya. As of the last report, monitoring the change in forestation between 2000 and 2003, the Cherang'any Hills were the least affected of the forests monitored, with 174.3 hectares deforested, this loss is occurring within Marakwet District and West Pokot District. Since this forest cover is indigenous, the report recommends that the area be closely watched to prevent further destruction. The thirteen forest reserves there are collectively known as the Cherangani Hills Forest. The De Brazza's monkey has been sighted here. The monkeys are confined to small areas in the Cherang'any Hills that offer them little protection. ^ "Kenyalogy: Geography - Rift Valley and Highlands". www.kenyalogy.com. Retrieved 2008-03-18. ^ "Mountains>Western Highlands". www.magicalkenya.com. Archived from the original on 2008-06-03. Retrieved 2008-03-18. ^ Joseph Bindloss, Tom Parkinson & Matt Fletcher. Kenya - Google Book Search. books.google.com. p. 328. Retrieved 2008-03-18. ^ "- Changes in Forest Cover in Kenya's". www.africanconservation.org. Archived from the original on June 1, 2007. Retrieved 2008-03-18. ^ "Changes in forest cover in Kenya's five "water towers" 2000–2003". United Nations Environment Programme (UNEP). Archived from the original on 23 June 2006. ^ Karere G. Mugambi; Thomas M. Butynski; Mbaruk A. Suleman; Wilbur Ottichilo (1997). "The Vanishing De Brazza's Monkey (Cercopithecus neglectus Schlegel) in Kenya". International Journal of Primatology. Springer Verlag. 18 (6): 995–1004. doi:10.1023/A:1026352331577. Retrieved 2008-03-18. ^ Brennan, E. Jean (1985). "De Brazza's monkeys (Cercopithecus neglectus) in Kenya: Census, distribution, and conservation". American Journal of Primatology. Wiley. 8 (4): 269–277. doi:10.1002/ajp.1350080402. Archived from the original on 2012-12-16. Retrieved 2008-03-18. This Kenya location article is a stub. You can help Wikipedia by expanding it. This page was last edited on 23 February 2019, at 23:07 (UTC).